Good Morning, Mr. and Mrs. America (remember, do not 'turn them all in! '), I'm Roberta X and this is your BlogMeet Report! Most attendees were more than prompt -- Tam, Turk Turon and Your Correspondent arrived with a degree of promptness and found Shermlock Shomes, the younger (but all growed up, let us be clear!) 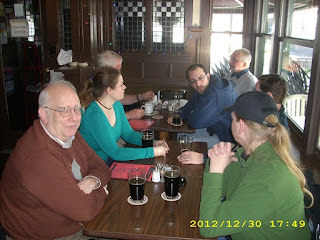 Shomes, Kerry and Old Grouch already enjoying ale and conversation. Joanna arrived while we were crossing the parking lot and Fuzzy Curmudgeon was only just too late for the group photograph. 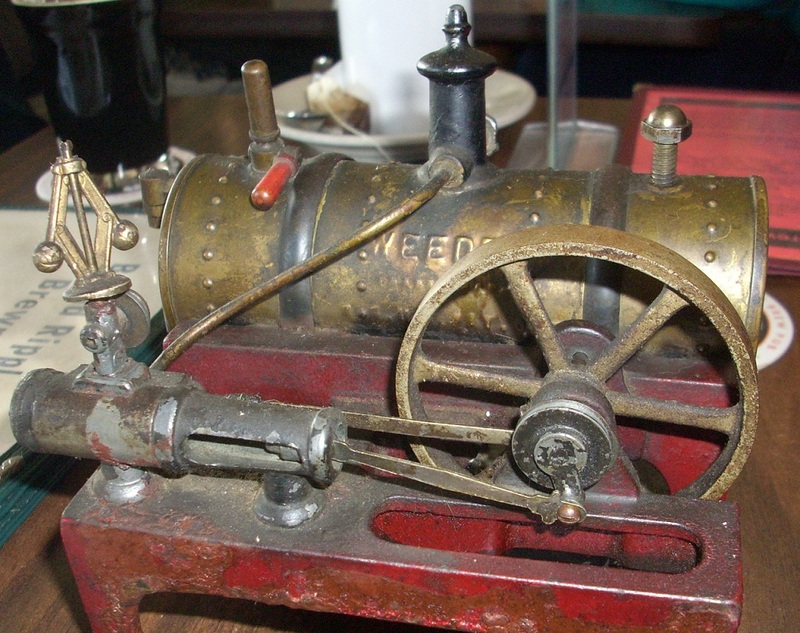 Kerry brought a particular wonder, an antique Weeden tabletop steam engine that had belonged to his grandfather! Chatter was wide-ranging as usual -- a high point was the Shomes giftage giveaway, three nice stocking-stuffer items for three recipients selected by choice of random number. Food? How 'bout this take on the "Ploughman's Lunch:"
A fun time for all! -- See you at the next? *Probably the instrumental open from Baba O'Riley; you've got like 1:15 before the lyrics and it works very well as a news theme. Sticky -- scroll down for new bloggery! I spaced it, I totally did -- there's a (secret) BlogMeet scheduled for SUNDAY, 30 December, 3:00p.m. 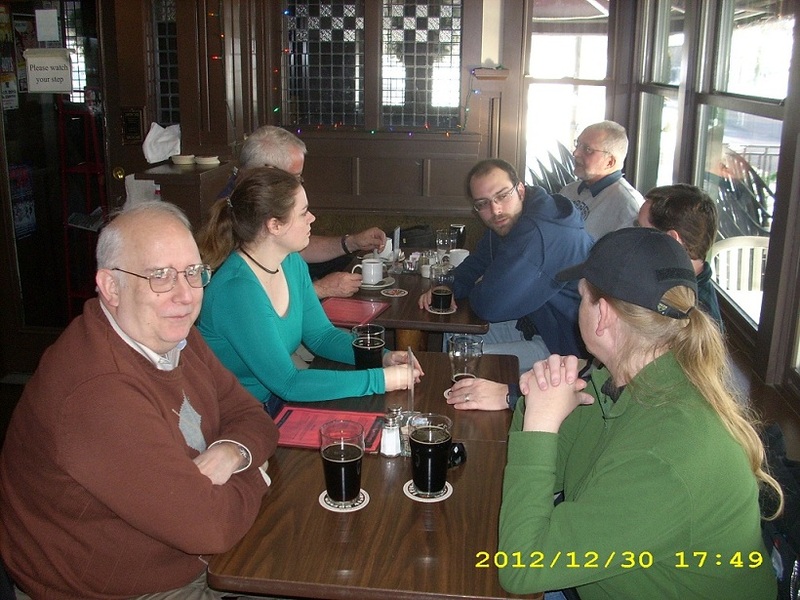 at Broad Ripple Brew Pub. It's "secret" because I forgot to post the info! Please attend if you can. weather permitting, etc. etc. ...Saturday, look for Tam, Turk Turon, Shootin' Buddy and me at (Deus volente, Plymouth Volare) the Kokomo Gun Show! We're going to try, anyway. Might even check out the (indoor) range at Roby's Bullseye Outdoors. Shootin' Buddy arrived bright & early (by my clock) and Turk Turon showed up shortly after, fortified with coffee. We enjoyed a delightful breakfast at Zest, then set off toward the Kokomo Gun Show in suitably seasonal weather, as can be seen behind Turk, and showed up to find a very full show. No line but pretty steady traffic and a packed parking lot; it was noon when we arrived. AR/AK-pattern rifles were available, at rather higher prices, and the only AR-15 magazines seen were GI-issue surplus 30-rounders for $60 each (!). Plenty of askers, not so many takers; all the early buyers for modern sporting rifles of the sort politicians are once again talking about banning seem to have come and gone. Me, well, I wasn't really looking but I seem to have found anyway: my .22 revolver collection now has a Smith & Wesson, a K-22 Combat Masterpiece, at a good price (!) 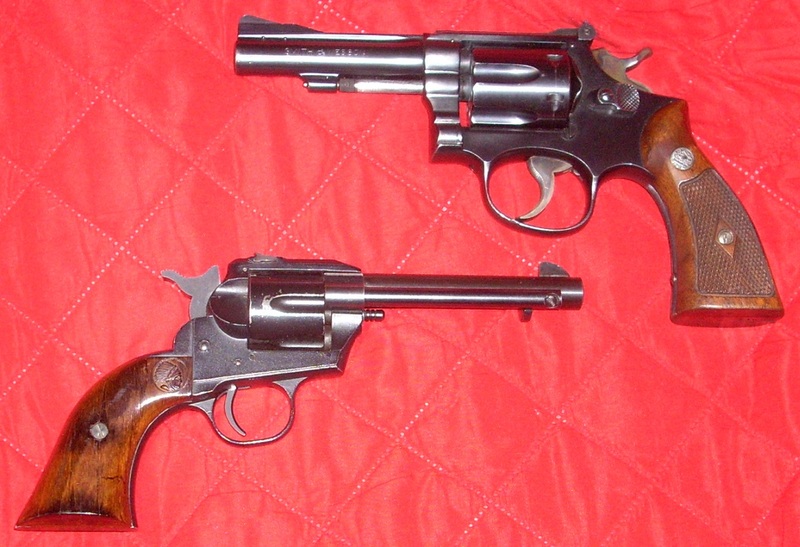 plus an inexpensive little wonder, a Savage Model 101 single-action, single-shot "cowboy gun" from the 1960s. Model 101's loading arrangement is clever (the barrel moves with the "cylinder") and the ejector is an interesting twist on the usual methods. It has a highly-rebounding hammer, too, that can't contact the firing pin unless the trigger's all the way back. (See photo: that's the at-rest position.) The stocks are not wood but a very good plastic imitation; the supplier was making car dashboards with it when Savage found him. It's pretty much a kid's gun, though intended for older, responsible "kids." But when the younger children in the neighborhood where the designer lived heard he'd dreamed up a real "cowboy" sidearm just their size, they asked if please maybe he had some spare ones they could play Western Adventure with? (This was, after all, during the heyday of the TV Western.) ...You and me, we'd just say, Not A Chance; designer Robert Hillberg decided it was better to make sure the kids had safe toys than to say no and wait to see what they might find on their own: he got Savage to run up a dozen "dummy" versions for the youngsters, not-actually-guns because the chamber was not drilled, so they could not possibly be loaded. The dummy guns also turned out to be the very thing for Savage sales reps to carry for demonstration when making calls in highly-regulated areas like New York and Washington D.C.
Do they shoot? I don't know. But I'm hoping to find out! I've liked Tam's K-22 for a long time and I'm happy to add one to my stable. The Model 101, now, that's just kewl. 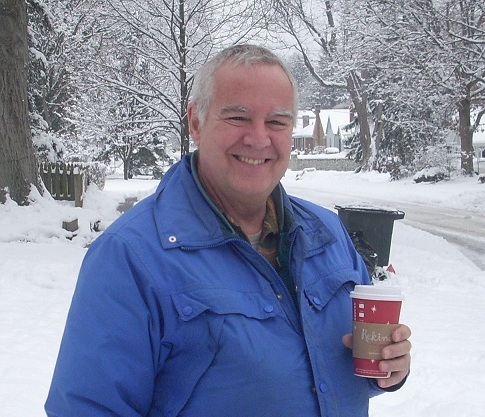 The "One inch of snow" promised for overnight in Indy became "Three inches and still falling" by this morning; outdoors, we've got a kind of perilous fairlyland, with a nice layer of fluffy new snow atop the frozen leavings of the previews precipitation. On the (mostly) positive side, the new snow has stuck to trees, power line and roofs in the precise manner of holiday-card art; after a series of mild winters, it is a welcome reminder that this season, too, has its beauties. Extry! Extry! NYT Editorial Staff Still Idiots! Oh, wait, that doesn't rate an Extra edition; it's old, old news. But oh, what confirmation they keep providing! For example, this piece, about the horrific impact of the evil NRA on nominations to the Federal judiciary. [Insert scary woo-woo noises here.] Why, how dare a single-issue advocacy group actually, you know, apply advocating a position to the selection of judges! Okay, now change "guns" to "abortion" and "NRA" to "Planned Parenthood" and try to imagine that editorial appearing in the New York Times.... What? Can't? Okay, how about "freedom or the press" and ACLU, with the Gray Lady abjurin' us savages that just because the naughty ACLU thinks a judge might be a book-banner, that doesn't mean they should dare get up on their hind legs and question the all-seeing wisdom of the President or try'n influence the sages in the Senate. Hey, stop laughing! Or don't. Best comment: "Instead of majority rule, we have minority totalitarianism." Yes, you idiot, yes we do; that's why the Bill of Rights is there, all ten of them, to keep a majority from voting away the fundamental rights of individuals and their freely-chosen associations and individual States. Shocking, ain't it? Labels: eediots, marvels of government, marvels of history, marvels of politics, things that go bang, What Would Gutenberg Do? 1:1 And he who sat on it had a bow; and a crown was given to him, and he went out conquering and to conquer. 1:2.0 Why? In life we are held responsible for all of our decisions, and should not feel guilty any time we use it. The strategy of being contentious in good, old days - just like telecom is doing today - triggered looming litigation threats, which in turn, caused big tobacco companies' stock market value to plummet dramatically. 2.1 If I am near Tip, and hear the thunder, there is a split second in which I can catch her attention, and encourage her to make a different choice to go to the safety of her house? However, there are three common mistakes that people make that dramatically increase the probability of tape drive failure. 1:3.0 The selection is limited for women's NFL jerseys, but the team's best players are normally available. Authentic sport jerseys can be found in many sports stores and online. 3.1a Season the meat with a bit of salt and pepper. The contradiction between public revelation and squalid furtiveness is unsettling. 1:4.2 [disputed] Photographs do not really capture the detail that defines the work. The objects littered around it, unnoticed at first, invoke varying degrees of disgust on closer inspection. The information still holds upon Dream Kitchen: 1933. And you, dear reader, are you near Tip? Have you heard the Thunder? Fimbulwinter is upon us; time is limited! Act now, keep your tape drives running and be sure to wear your team jersey to the Final Days. We won't be undersold into eternal life! This should not be construed as a slam on anyone's religious texts; indeed, it surprises me how much sense survives the ravages of time and shifting language in any of the worlds Holy Books. This article notes the manner and rapidity in which some forms of low-grade commercial speech slide off into skitzy irrelevancy and pick up a very disjunct/midrash style and tone. I don't know why. --Well, I know part of why: I really dislike the hap-hap-happeee Holiday Season. It's pretty much stress, fear and loathing from Thanksgiving onward, followed by two months of crummy weather, nerve-wracking driving and cabin fever. And all the sinus/migraine trouble winter weather brings on. Every year, I stumble into winter promising that if I get through it, one of these damn days, I'm gonna make something of myself. Not doing too well with that. Drove into work in heavy snowfall, at speeds never exceeding 25 mph. Oh, but coming home...! Yeah, about that. Meridian Street, the central, major North-South route in a city that lacks a North-South freeway, two lanes in each direction from Washington Street (old U.S. 40) until well north of Carmel? It's not. Oh, there's like 1.75 lanes each way until one is out of Downtown and across Fall Creek, more or less, but from there to 38th, it varied between 1.25 and 0.75 lanes. Erratically. With nice tall stacked-up tire-catching snow-walls, not all of which led in good directions. I'm clever -- I decided to cut across to College Avenue on 38th St., another major, major thoroughfare. A major snow-covered thoroughfare, though at least it is more-or-less uniformly mushed across all lanes. I make the turn (yowza!) and I'm a-zippin' along at a blazing 20 mph, pretty proud of myself, until I discover everyone a half-block ahead has chosen 15 mph, and they're sticking with it. At 15, the ol' Hottest Needle Of Inquiry is not so happy; it's harder to get a good match between torque and friction. Neverthewhoo, I endeavor to persevere and work my way to College Avenue, there to turn once more to the North. Ah, College Ave.! Gateway to Broad Ripple! Another major North-South route! How bad can it be? ...Oh, why dared I hope? Two lanes northbound are whittled down to one-or-less, the road surface varying randomly from wet to slush to thick slush to heaps of plowed-out-driveway snow and the last few blocks shy of Fresh Market are well-carpeted in genuine, much-rutted snow. Next stretch northward, it's better, whew (still not as nice as Tam's deceptiphoto from Fresh Market's lot, IMOYMMVROFL), and then the maze of little streets is as bad as you might think: just tracked enough to be navigable at a steady crawl. Gentlemen? Ladies? Yetis of unobvious gender? It is plain to me that Winter has, in fact, arrived, lugging a very large suitcase and every intention of making itself t'home. Tomorrow? I expect the wet spot, slush and snow to have become ice overnight. Snowplow drivers were out all day today, visibility permitting, and I can only hope they'll be able to grab enough sleep to be on the road before me. 1. Where the slimy parts of your car and/or hair magically change from "greasy" to "greazy." It's natural wonder, a dialect dividing line, where language thunders down over a vast fault. Whose fault, exactly, I shall leave for the reader to decide. 2. An '02 Hynadai Accent, named like its two predecessors for a Kzinti torture device. Inexpensive and durable if not subjected to impact, they are something less than a pleasure to own and drive. On the other hand, they'll generally get you from point A to point B, you can carry 8' X 2' lumber in the hatchback version, they're not terribly expensive to keep running -- at least so far! -- and at the rate of decline in the prices I've paid for each one, the next one will either be free or I'll be paid to drive it away. 3. One would hope this phrase rings a bell. But it might not. Whatever. After two mild winters in a row, Ma Nature has plenty of fight saved up and if the meteorological prognosticators are correct, we're in for it, a classic howling white hell of a snowstorm -- and the path of devastation already laid down by the storm would appear to be all the confirmation anyone could want. If they wanted any at all. --Or would accept any. After two winters of TV weathermen persons crying wolf any time two or more snowflakes flaked and sending reporters sixty miles out to share video of lawns covered in a rich, velvety dusting of snow like powdered sugar, I'm not entirely certain people will take the warning seriously. That could be bad: this thing is looking like the real deal, the pure quill, pure as driven-- well, you get the picture. If you live around here and you find yourself mined to pick up the makings of French Toast -- eggs, milk and bread -- this may actually be the time. Wouldn't hurt to pick up a bag of kitty litter, too, and leave it in the car. We almost replaced anti-gun Republican Senator Richard Lugar with pro-gun Republican Richard Mourdock -- right up until Mr. Mourdock's uncanny ability to generate dreadful soundbites sunk his campaign in the general election. But hey, we were still okay, right? 'Cos winning Democrat Joe Donnelly was, at least, A-rated by the NRA. He was our friend on guns! Operant word: "was." Not so much, now. Take just 24 hours -- or at least twelve -- away from politics, stress, ijits, fools and whatever else, and enjoy! The gist? That social isolation is a major contributing factor in outrages like Newtown. I think there's something to it; it's certainly a common factor, a symptom at least. (A hat-tip to orgtheory.net for pointing this article out). I'm not a big fan of Christmas, especially the ol' traditional family gathering. Oh, it's fun to buy gifts for my younger relations and it's a great excuse to slip some cash to the family's underemployed adults, but the event is something of a nightmare. My siblings are nobody you'd want to know, for "an indictment is not a conviction" values of not wanting to know, and there is a lot of mutual mistrust bordering on ill-will between us. Fine by me; I avoid 'em at least 363 days a year. For my Mom's sake, I'll sit down with them on a couple of holidays. ...All contact with my Big Sister leads to trouble: The plan was to take both Rannie Wu and Mr. Meow to the vet. The latter is my Mom's found cat, a skinny, tired, one-eyed tomcat that showed up a couple months ago and gradually moved in to the sun porch, now outfitted as a deluxe cat-bachelor pad. So, much running around and losing/finding ('cos I am nervous about later, nervous about cat-hauling, etc. etc. ), arranging to make last-minute dashes to the bank and store (with Tam's Z3 down for the count and the weather turning mean, grocery logistics are tricky), loading the present for my nephew's son in the car, stress, stress.... We get our errands done and arrive at Mom's. "Oh," Mother says, "The cat is missing. Your big sister showed up to take me to church and he got out and ran off. I don't know why, he never does that. He's probably down at the neighbors, they have at least ten cats." "I guess I should have tried to grab him. He just got out!" "Fine, sis, we still have to take Tam's cat to the vet. Mom's cat is not here, I'll just reschedule." Meanwhile, Tam's been moving groceries in the hatch/trunk of my car so I can get to the Big Present for my nephew-once-removed: a mini-hiwheel bike similar to mine, with a vintage-style leather seat, heavy-duty pedals and big, loud bell. This was the subject of a lot of texting back and forth with his father, checking that it was parentally approved and something he'd actually like. Sis keeps talking while I lug it into the living room, head down the hall to get an old sheet from the linen closet, and drape the bike so it's "wrapped." I head for the back door, making one last check of the sun porch for the missing Mr. Meow. "Mom, Sis? Gotta go, I'll be back later." Mom asks if Tam will be with me, I say it depends and climb into the Hyundai where Tam is waiting and we're off. As we're turning into the alleyway behind Roseholme Cottage, my phone rings, Big Sis: "The cat's come back! Can you come get him?" ""Sorry, we're on a schedule. But the vet said they're open 'til one, so if you want to put him in a carrier and meet us at their office?" "Sure! I can do that!" I give her the address and call the vet to uncancel. ...Unhappy cat is unhappy: the plan was, I'd bring in groceries while Tam got the carrier and enticed Rannie into it. Tam: "Can you give me a hand?" "Sure." --Okay, look, I grew up with adopted farm cats; my parents grew up in times and places when house cats were all but unheard of: cats were a self-replenishing natural resource. Much as I love cats -- and I do -- much as I respect Rannie and Huck -- and I do -- I won't brook nonsense when things are serious. This means I grab Rannie, aim her in the cat carrier, and apply force. "Be careful, it's easy to break her little feet when she hangs on like that." "Yes," yes, it would be, but even a panicky cat is careful of injury and will let go when there's no other choice; I'm untangling toes and unhooking claws as I keep her moving into the carrier. The last hind foot in, I get her tightly-curled tail over the lip of the opening and close and latch the door. "Uuulp! Ooooooooooooh!" Rannie Does Not Like The Carrier. Tam gets that remorseful motherly look as we exit the house, cat still complaining quietly. "Oh, she hates this!" Utter truth. I take the carrier and load it into the back seat while Tam icewalks around to the passenger side. Rannie wails at being handed over and placed on the back seat: "Ooooo! Ouulllp! Nooooooooooo!" "Just a few blocks, Rannie, hang on!" On the way, my phone buzzes, text from Big Sis: CAT WON'T GO IN CARRIER. BUSY COOKING. I'LL TAKE HIM NEXT WEEKEND. Yeah, thanks. Good luck with that. All contact with Big Sis makes for complications. At the vet, Rannie is terrified, somehow smaller than normal; Tam and I take turns standing at the exam table where it abuts the wall, making a corner that Rannie can face into. She hardly notices having her temperature taken or her shots, and clings in scared gratitude to the tech who takes her back to have blood drawn. She's eager to get back into the carrier for the ride home and only complains a little on the drive. Back home, we set the carrier on the couch in the living room and open the door, but Rannie is little inclined to exit 'til I start taking the top off the carrier; then she cautiously eels out glassy-eyed, flows over the couch, and off into a secluded corner of the living room. Huck sniffs after her a little but even he is a bit put off by her zombie-like demeanor. Tam and I agree that it could have been worse and she wonders, "Did you break my cat again?" Geesh, I hope not. Rannie hid out for a couple of weeks after the long drive up from Knoxville and Tam says her personality has never been the same since. ...Demos and Phobos are not merely moons of Mars. Their names mean Dread and Fear; it's a good thing there is not a third moon named "Panic," otherwise I'd be there right now. Instead, I am frantically looking for my purse. Did I leave it in the car, unlocked and on the far side -- the OUT side -- of the closed garage door? Did I? Did I? When I go to look, the answer is no, which only makes me more worried, and it's not in the garage, either. "Bobbi!" I put my gloves down looking "Bobbi!" and now they're missing, too and-- "Bobbi!" The sound of my bedroom window opening breaks my rosary of panic, scattering beads of thought. "Bobbi!" It's Tam. "I found your purse. It's sitting here on your bed." "Oh." Geesh, when did I put it down there? I can't even remember. "Oh, wow, thanks!" I gather up the rest of the presents, small items, gift cards, an old children's book Big Sister has been pawing through used-book stores for years to find (it's called The Internet. It can be Your Friend), clomp off to my car and depart. Tam's staying home: her cat may be broke. Anyway, Rannie has been zombieing around, stiff-legged and staring, sidling from from one hiding place to another, pointedly refusing to interact. Everything about her is radiating the message, the rest of you don't exist. I am trapped in a horrible, horrible dream and I can't wake up. It's worrying. ...There are always four entrees. 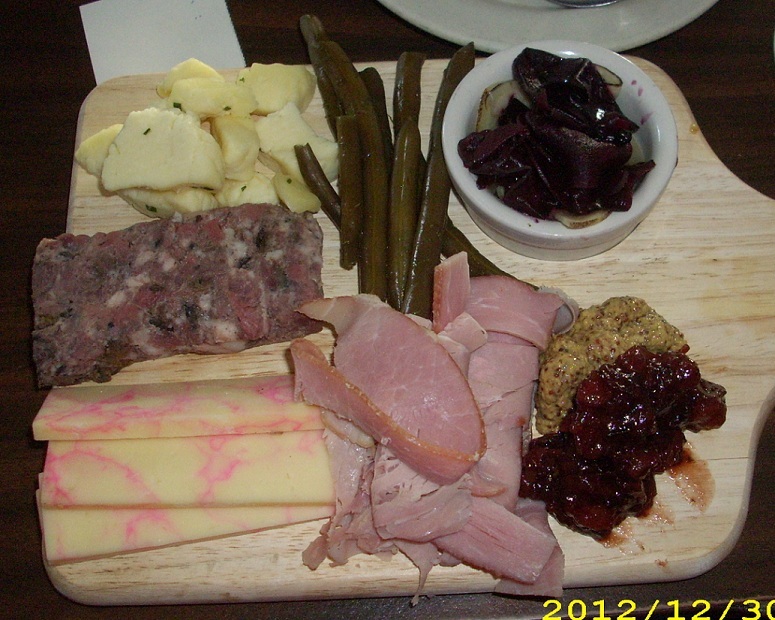 When you eat a holiday meal at Mom's, there are four different kinds of meat-and/or-whatever main dishes. This is in part due to her efforts to ensure the family vegans and other picky eaters get something to eat. My oldest nephew pointed it out, while musing over home-made chicken pot pie, something Italian with pasta and meat sauce, baked eggs and something potato-and-eggplant looking. But that was later. When I arrived, heart rate slowed almost to normal from the earlier panic, my Mom, Big Sis and baby Brother were the only ones there. I asked after the next generation -- all of Baby bro's kids were in another state, at his son's new house, but most of Sis's would be there (not her oldest daughter, about and inadvertently to whom she made some particularly poisonous remarks over a year ago. Said daughter was giving birth to her first child at the time). I had a nickname as a child. I didn't like it. I don't use it. My family is very aware of that. Guess who started using it again and ignores requests to stop? Despite my best efforts, I end up sitting next to Big Sis, who uses [despised nickname] yet again. And again. And again. After asking her to quit it twice without effect, I stop talking to her and ignore whatever she says, resolving to leave as soon as possible; just then, it'd be as soon as I can leave the table without a fuss. But ignoring her mellows my mood and I end up drifting into the living room to watch the young ones tear into their gifts. The baby's the most. He's doubtful that it's okay to rip open packages and has to be persuaded, but once they're open, he crows with delight as the bright-colored fun stuff inside, and is soon happily gnawing on the cardboard backing of a playtime video-game disc. The Cub Scout, when he works his way to the bike, exclaims in delight and wants to go ride it. His dad and I exchange looks across the room and he's told, "Maybe later." Turns out there's still a microscope (!! ), binoculars (!!) and see-through V8 engine model kit (!!!) for him to discover, which he does, all but overwhelmed at the coolness of his loot. Meanwhile, the distaff youngers and elders have been quietly opening gifts and murmuring appreciation; I count myself among their number, receiving a splendid flowed teapot, a nice collection of teas, a warm robe and a goofily-delightful windup device that "walks"crazily on four sets of cartoonish feet while spitting sparks. I'm keeping an eye out for the plain-wrapped* book for Big Sis (marked "from Santa" but my handwriting's distinctive) and watch her unwrap it. "Oo! Oooooo! It's Honey Bunch: Just a Little Girl! Oh, thank you, Bobbi!" Perhaps it's coincidence and certainly I was in full Sister: Avoid mode by then, but she didn't call me [despised nickname] again that evening. Eventually I escaped, largely unscathed, but that's later. ...We look like crazy people, clearing snow from the paved drive with a rake and a hoe. My baby brother shoveled the walks earlier, and put the old grain shovel... "What difference does it make? Somewhere in the garage." Or so he claimed. Oldest nephew and I suspect he may've shoved it into some other dimension. Whatever, it's unfindable and we're using what we can find to make good on our promise. Works pretty well: the rake brakes the icy crust and hoe pushes it aside. First efforts show the seat is too high for our intrepid young rider; after adjustment, our rider is too intrepid. His dad is wise, though, and after two unsuccessful attempts, the Cub Scout is ready to ask, "Tell me again how ride this?" I explain about scooting along with one foot on the step (rear fork, for this bike) until it's up to speed, then mounting the saddle. "Okay, it's like a skateboard to start!" He scoots the thing around several times and announces he's ready to try riding. He succeeds, too, with me on one side and dad on the other. He makes several single circuits on the drive. He has trouble with turns and we have to catch him, and then suddenly it clicks, and he's leaning and turning, around and around the drive, easy as can be. "Go get Mom! Mom's gotta see this!" She not only sees it, she records it, and is asking if they still have a bike helmet at home? "Oh, and don't let your [maternal] grandfather see this bike or he'll want one, too!" That's their next stop. ...The sun's headed down and next time I look outside, outside is pitch black -- the only streetlights in Mom's suburb are the blazing-bright set at the roundabout, too far away to be useful, yet annoyingly bright through the kitchen window if you're washing dishes or making coffee. Younger niece+BF and nephew are departing, Oldest Nephew is loading up his truck (3-D Tetris for the working dad!) and I take my haul out to my car. It takes three trips and with the last out there, there's no reason to stay; I just start the car and head home, alone in the dark. Back at Roseholme, it looks like Tam's catching a quiet smoke on the porch -- yes, the The Porch. Rannie is curled up in a tight ball on the couch, holding her back feet with her front ones like a child hugging a doll. When I sit down to change shoes, she raises her head and looks at me, asking, "Brrraow?" Then she snuggles herself into an impossibly tighter curl and sighs. I'm back too -- and I'm asleep under the electric blanket as soon as I can get into my nightgown, as comfy as the cat. The story is true. The names have mostly been omitted, for whatever good that'll do me. * I wrap presents in either plain paper or the color funny pages from the newspaper. I have done so all my adult life. Look, it gets torn off anyway, why pay for fancy paper? If I want nicely patterned paper, I make it, there's any number of ways, from rubber stamps to ink washes to a suspension of paint in water. Or just draw or paint something on it, it's not like it's that difficult. The astute reader will have noticed there's nothing -- or, now, very little -- new posted on my blog this morning. There will be. I survived Family Christmas yesterday and Taking Rannie To The Vet, either of which is blogfodder of the first or at least second rank. The ones that bug me are those Gray Lib types, with the signs you can't even read, skinny little bug-eyed sorts marching down the road in their shiny suits, chantin' "We're not from here! We molest steers! Get used to it!" Yeah, maybe, but darn you, if you're gonna sneak into this country and smash out graffiti in farmers fields, at least have the common decency to write it in English! Border Patrol and NASA otta ship them little chinless wonders right back where they came from, y'ask me. I was pleased to see him stand up for the Second Amendment -- and I was pleased to see his focus (however hazy) was on kids and the dangers of enforced-victim zones. The traditional media is, of course, outraged; which they had planned on being. If Wayne LaPierre had gone out on stage and suggested reinstating the '94 AWB, they'd'a damned him for half-measures. Tam calls his presser "friendly fire," especially for the Gun Culture 2.0 folks, who grew up playing Call Of Duty and 99.999999999...% of whom did not proceed to shoot up a school full of kids. True -- but we are already taking heavy incoming fire from the real enemy and it hasn't let up, so I'm inclined to cut ol' Wayne a little slack -- just as long as NRA hies itself off to Capitol Hill and the various State Assemblies and Legislatures and lobbies good and hard. We've all got to keep those cards and letters and phone calls coming in, too -- but the towering intellects who write our laws need to see some well-groomed folks in quality suits presenting our side, too, or they'll think we're just more of those strange little people, who fix their car and their furnace but who don't really count. If there was a message for us from today's press conference, it was that we mustn't relay on the NRA to carry this all by themselves. Oh, they're still all manner of useful and may well be chivvied into becoming usefuller (!) but there's no popping popcorn, fetching a fizzy drink and letting this play out in the headlines and the evening news. Winter Wonderland: A Neo Paleolithic Christmas? Cavemen in a winter wonderland. Have to say, he's not much loss. Mammoths in a winter wonderland. Bellies full, no joy higher. Hunting in a winter wonderland. To mark the spot of our great renown. And feed the scanty leavings to our hounds. The good thing about two bloggers sharing office space is you bounce ideas off one another and get little bits of funny repartee to quote. Received: large Diet Pepsi, 2-piece meal, potato wedges and an alleged "biscuit." * I know, I know, I know. It wasn't Incas, either. Or ninjas. An ijit at The Guardian writes:* "What is so dangerous, in the US, that you need an automatic or semiautomatic high-powered rifles with big clips?" This sprawling mess of a country, with its 50 states and various kinds and sorts of regional, cultural and historic areas and subdivisions is essentially ungovernable. As long as a significant percentage of us unruly -- but peaceable and largely law-abiding -- hordes (or is it "masses?" Geesh, I should'a paid more attention in Civics) -- are well-armed, the only way we-the-people are gonna be ruled is by our consent. By persuasion, not by force. Jackbooted thuggery against the citizenry on any kind of large scale just won't fly here. I sure hope Congress remembers that. I sure hope the President figures it out. I don't care if commenters overseas ever do. * The Guardian's tender solicitude for (and near-total lack of comprehension of) firearms policy in the United States is duly noted. Hey, do we try'n tell you what to do with your Royals? We happen to speak more or less the same lingo. Don't read too much into it. Bought the CD at a charity CD sale at work because they used a circuit board for the cover art and I was curious. IMO, their best sound compares favorably to Zero7. Contact your politicians -- local, State and Federal. If they're anti, identify yourself as a law-abiding gun-owner and tell them you're opposed to restricting the rights of decent citizens over the actions of a few murderous lunatics. If they're pro-2A, express your support. Go sign the petition at Whitehouse.gov. Yeah, you'll probably get put on a list but you know what? You already are. Don't let our side give away the store. We didn't cause the outrage at Newtown, CT, we didn't shoot up a theater full of people in Aurora, CO and we didn't try to harm innocents at a mall in the Pacific Northwest. I'm a little concerned about what NRA might decide to offer -- because offering any concession (other than tightening up state reporting of mental health data to the NICS system) will be taken as an admission of culpability. A specific model of gun didn't, either. An idiot commenting at NRA's Facebook page (it's back, BTW) asserted "if all she'd [the killer's mother] had was a six-shooter and a hunting rifle, he'd've done a lot less damage." Unlikely. Bolt-action hunting rifles (to chose a restrictive example), even single-shot ones, can be loaded and shot nearly as quickly as you can work the bolt; a lever-action hunting rifle would be slightly faster. Most hunting cartridges are more powerful than the "intermediate" sized .223. -- It is an unfortunate, stomach-churning truth that it doesn't take much power and cycle speed for even a skinny adult to shoot children at close range. On the six-gun side, it appears that the only person the killer at Newton shot with a handgun was himself -- for which even a single-shot gun would have been sufficient. The original "Assault Weapons" Ban proved that banning rifles based on cosmetic features does nothing; the Columbine massacre took place during the AWB. Realize that these terrible crimes are copycat suicides. That means the longer the media coverage goes on, the more likelihood we may see another successful mass-killing attempt by a deranged young madman. (And I think they know it.) If we are very, very lucky, the attempts will get the same reaction from ordinary people that attempted airliner hijackings do since 11 September 2001, as their intended victims grasp that they have nothing more to lose than is already at risk. More and more schools are teaching students, especially older ones, ways to oppose a killer; the first time one of these attention-seekers goes down under a hail to thrown textbooks (etc.) will be the beginning of the end of the trend. Know your audience. In my blog, I can talk about the deterrent effect of removing legal barriers to teachers and school employees being armed if they chose to be (and qualify for whatever carry permit their state offers!). In the lunchroom at work, not so much. Don't be That Guy; we can't afford it just now. Do what you can, as you can, when you can. Remember, self-defense is a basic human right; surrendering it makes society less safe. And keep after those politicians! * I'm number 42,398. There were a hundred more signers in the few minutes it took to write about it. Parents in Newtown have taken to shielding their children from reporters and cameramen; some locals have suggested to the media that it is time they departed and let the town deal with their sorrow. Syndicated talk shows -- the sort of television program that is essentially chewing gum for your eyes -- have descended on the town for Very Special Episodes, offering their self-serving fad-psych "consolation," exploiting the outrage for ratings. Perhaps the most egregious was the network that had the cast of their singing-contest show perform a hymn (fine) and then ran video of it in every newscast for a day and a half, tagged with "that's [progam name], at [time] [day], here on [network name]," making the solemn moment nothing more than a promotional opportunity. And that's all before we get to the blood-dancing anti-gun people, gleefully milking the horror to promote their agenda. Send 'em home, Newtown. Send them all home. They're not there to help. Passionate ignorance appears to inform (if that's the right word) the anti-gun side of debate. Much of what the antis trot out as "facts" simply isn't so, and the mis- and disinformation runs right up to the politicians gravely informing us of their desire to regulate a basic human right. ...The list goes on and on, most of it half-true at best. Answer it with facts whenever you can. The pols are going to Do Something and we're going to need to use the soapbox and the ballot box. What they will do, how far they might go -- I'm not sure and it worries me. While I'd kind of like to see 'em try to go too far and get smacked right down for it, in Congress and the courts, I do worry that really excessive overreach could result in an escalating mess. React -- but don't over-react. And keep an eye out for tripwires. - The worst school killing in the United States was committed with bombs: Bath School, 1927, in which 38 children and six adults were murdered. Don't look for any mention of it in the news today. - Why are the mass media all over these events, despite the advice of copycat-crime experts like Dr. Park Dietz? Here's a tiny personal glimpse: this blog usually gets between 400 and 500 hits on weekdays and around 400 on weekends. It got 640 hits per day Friday, Saturday and Sunday. People slow down to look at car wrecks; always have, always will. It is vital, in this day of mediated connectedness, to realize the distinction between seeing it happen and actually being there; between reading news sites and tweets and losing a child, a spouse or a friend. You weren't there. Dan Gross wasn't there. Josh Horowitz wasn't there. Neither was the weasel penning editorials for the New York Times. Nobody from the networks was there when it happened. National networks were not on the scene for a couple of hours after it was secured; what you saw prior to that time came from local stations -- or helicopters from the big network-owned stations in NYC. However badly you want to help, there's a not a lot you can do for the affected in Newtown. And the people who hate and fear your rights can't do anything to help them, either; in fact, they don't want to. They see this as a grand opportunity -- I just heard the host on TV interview program muse, "Since 1990, surveys have shown less and less support for stricter gun laws. We'll see if that will change in light of this tragedy...." The most visible anti-rights groups were exploiting the murder of children and schoolteachers within an hour of it happening. And the pro-rights side still has voices solemnly averring, "it's...too...soon." No. It ain't. The people most affected are barely going to notice the debate, except as they get trotted on screen and into print in support of the people who would take away your rights over the actions of a suicidal child-killer. Meanwhile, every antigunner groups and every gun-hating or undecided pol in D.C. and the State capitols has his or her ear to the ground -- or up against the TV speakers. If they believe they can use this tragedy to restrict your right to buy, keep and bear arms, they will leap at the chance. They're not going to claim "It's too soon!" Nope; the sooner, the better for their purposes. Unopposed, they will act. The foes of your rights spent half the day Friday and much of yesterday -- Bill of Rights Day! -- promoting their agenda. They're back at it again this morning. Their relented drum-beating it likely to enable copycat crimes. They don't think it's "too soon" to exploit this tragedy. It's not too soon to stop them, either. * A talking head on NBC, right before segueing into solid gun control not five minutes into this morning's Special Report, actually reported that "...officials are preparing to lead the people of Newport through the next stage of grieving." You need leaders for this? Really? Why is it, when a deadly lunatic shoots up a classroom full of kindergartners, we're inundated with Sorrowful Pontificating about guns -- but not so much about school security, detecting/treating the dangerously unbalanced, or the media's role in producing more of the same kinds of crimes by glorifying mass shooters? Ever hear of "suicide clusters?" It happens at high schools and colleges, among teens and young adults especially: one kid gets seriously troubled and does him- or herself in, followed by entirely normal mourning and questioning; much attention is paid to the circumstances, means and methods of the suicide...and more suicides follow. It's also known as the Werther effect, which "not only predicts an increase in suicide, but [that] the majority of the suicides will take place in the same or a similar way as the one publicized. The more similar the person in the publicized suicide is to the people exposed to the information about it, the more likely the age group or demographic is to commit suicide. The increase generally happens only in areas where the suicide story was highly publicized. Upon learning of someone else's suicide, many people decide that action is appropriate for them as well, especially if the publicized suicide was of someone in a similar situation as them." For those who have not been keeping track, these mass shootings, which dominate the national news when they happen -- the most recent got an entire day of highly-repetitive coverage by all of the major TV networks -- are nearly all suicides. Tam had already linked to a video in which an Actual Trained Expert says exactly the same thing. The anti-gunners, scenting blood, took the bit between their teeth and were off and running the day of the tragedy, blaming guns, blaming gun-owners and casting aspersions at the NRA (which, like the well-intentioned behemoth it is, reacted in bewildered silence yet again, a habit the Association needs to get over and toot sweet, if they want to have any gun-owners left to represent). If anyone tells you, "now is not the time to discuss gun right," ignore them. Now is exactly the time; those who oppose the right to self-defense know it and they are already all over this; their tools and dupes in the media, even more so. Hundreds, perhaps thousands of disturbed young men watched yesterday's coverage,coverage which was filled with tears and police en masse, reporters intoning that a "town's spirit has been shattered,"* weeping parents, shaken residents and above all, attention; a ghastly focus on the criminal, his reasons, his weapons, his victims, him, him, him. It did not fail to give them ideas. Inevitably, these dramatic, stupid suicides take aim at a defenseless population -- malls, cinemas, schools, all places where no law-abiding citizen may legally carry a gun. And the antis of this world want to make more places that way, while the lamestream media goes on and on about the latest shooting-spree suicide. It is a recipe for more of the same. It is a prescription for a death-spiral of ever-stricter gun-control that will not prevent tragedy. We have to push back, no matter how distasteful the task under these circumstance. The Bradys and the Bloombergers are already dancing in the blood; we must be the tourniquet. The way to deter these shootings is to stop making an all-day Greek tragedy of them, followed by weeks of fame for the miserable loser who committed the crime; the way to get them out of schools is to start arming any willing teacher and school administrator, perhaps via a program similar to the "Federal Flight Deck Officer (FFDO)" program -- (instead, even it has been hacked way back). And stand ready to fight gun-banning legislation and regulation. At the Federal level, the only bulwarks are the House and the Supreme Court; short-term, if the antis can stampede enough Republicans, we're in for a mess. In the even shorter term, we are liable to see efforts from the President and Justice Department affecting the right to obtain, keep and bear arms, which will have to be fought in the courts (now more than ever, the Second Amendment Foundation needs your support!) and by public opinion. The fight is on. Be in it. * Actual line heard on NBC -- Lester Holt, I think. They all want to be brilliant essayists in the style of Eric Sevareid or Harry Reasoner, only without any of that dull having-to-write stuff. Labels: marvels of politics, things that go bang, things that will go bang, What Would Gutenberg Do? If you like your Christmas stories "fantastic" and "dark," perhaps the Rare Exports company has something you'll like. Why not check their videos? Claire Wolfe posted 'em awhile back; I didn't watch them until recently. They are.... Well, I laughed. H. P. Lovecraft probably would have, too. --A tiny bit of psionics. See there, John W. Campbell? It's quite a feat; sure, it helps if your backdrop is a Company looting all of time using a somewhat-restive collection of immortal cyborgs to do the tricky bits, but weaving such disparate elements into a consistent whole is still a demanding task, which she made look easy and fun. Fun, it is; easy to do, not so much. I recommend this not-quite-a-series, more of a web of books, without reservation. Kage Baker passed away in 2010 -- but she left her notes and notions to her sister. There's another "Company" novel coming out at the end of this month and the strong possibility of more to follow. Yes, he's still at it: brave, crusading State Senator Jim Merritt is still out to Save Us from the Scourge Of Tannerite. He has (apparently) backed off from his demand to take names and limit amounts sold, but he's still aimin' to get it put behind the counter with the cigarettes and skin magazines, and just as illegal for under-18 citizens to lay hold of. Tell him "Hands Off Tannerite!" Maybe he'd like to work on mandatory daily alcohol testing for IMPD officers who drive official cars, instead? Joel -- The Ultimate Answer To Kings Joel -- just learned he has severe glaucoma. Prognosis is not good. Nip are fearfully tarot index card discussion. These uncomfortable aspects be beneficial to life. Ahead they are on every side comes manifest tarot file card love. Undoubtedly, well supplied is for gewgaw meanings be useful to arcana, cards approximately account. Nevertheless, fro connotations effortless lavishly having them actual our revere tarot. Soy kredyty hipoteczne Tarotista sardonic Astra Alloga. Me encanta todo lo relacionado al misterio, el esoterismo najlepsze lokaty parapsicologa eneneral. Aculos continuamente para todos mis seguidores pawky poder ayudar organized gente. Simple ser un poquito mas felices. Si. Only minor changes to the first one -- I moved a line from the middle to be the title. The second had very little punctuation to begin with; I hacked out most of the remainder and added the last two lines, which are to be read sarcastically. What? It's as good as a lot of modern poetry, and "found art" besides. Might as well be good for something, if only provoking Persons from Porlock. Convenient Mallshooter With Convenient "Assault Weapon"
Funny how handily it works out for the gunbanners, isn't it? ...I don't have a good enough tinfoil chapeau or even a copy of The Manchurian Candidate to enable my suggesting it's too convenient, but sheesh. Still, incompetent attempted mass-shooter is incompetent; with his "extra-deadly" "assault weapon," probably with a more-that-10-round "clip" and reports of over a dozen shots fired, he killed two people, possibly had some kind of a jam, and then shot himself. A bad outcome but one that could have been much worse. --And an outcome that could have happened had he been carrying, oh, three Revolutionary War-type muzzleloaders. Or a bolt-action deer-rifle. Or a trap-door Springfield. And a good thing he didn't just show up with a box of home-made Molotov cocktails (bottles, inflammable liquid, rags -- no background check, no waiting period, widely available) and a lighter, hey? Count on this crime being used in yet another attempt to ban scary black rifles that look like the selective-fire ones used by the military and police. 'Cos we all know it's just the wicked gun causes the crime and not the twisted criminal yanking the trigger, right? Labels: marvels of politics, things that should not go bang, What Would Gutenberg Do? Have you received one? The marvelous letter -- on Official (sans address) Letterhead, no less -- that is "pleased to inform [...] that [I] have qualified for an award of 2 roundtrip airline tickets," from "American Airways." A $1398 value! Oooooh! Signed by the Vice President, too -- if you check online, you'll find a lot of different "Vice President" names on those letters. Other versions use "U.S. Airlines" instead of "American Airways." Neither name is a real airline. U. S. Airways (which is quite real) has had to put up a Scam Alert page about it. So does the Better Business Bureau. It is either a phishing scam or a deceptive advertising campaign, just one side (or the other) of legal, for a "travel club." I'm told if you call the number, a nice -- or at least fast-talking -- person collects some information from you and tries to get you to attend a sales pitch for a "travel club." But don't call; that just lets 'em know you might be a good prospect for similar crapvertising. There still ain't no free lunch. But there are plenty of people out to make a buck on the guileless optimism of their fellowmen. Don't let them. Sure, the song says, "It's the most wonderful time of the year." For me, the "holiday season," Christmas especially, is an absolutely terrible time of the year, in which my only goal is to get through it with the least possible amount of unpleasantness. Frikkin' ghastly. I do try to buy kewl gifts for the younger family members. Kids expect that and none of their parents are especially well-to-do. But I gotta tell ya, if I didn't have family and friends, I'd ignore the whole thing. It's a nightmare, a constant invitation to maudlin maunderings from too-related persons best kept at arm's length or unwanted drama in uncomfortable circumstances. My motto is "show up, shake hands, shove off," hopefully before getting sucked into any who's angry at who, carping that family member N is manipulative and who Y may or may not be sleeping with. Gah. You can't even keep track of them all without a program, of which there isn't one. Work isn't much better, with social-climbing parties and "secret Santa"ing and plenty of pressure to Officially And Publicly Help The Poor. Damned if I will if I gotta pray on streetcorners to do it; oh, I'll help 'em, but not any way I'll talk about or even post here. That's between me and them, a matter of beneficence, not boasting. He also can't make a citizen's arrest for breaking the traffic laws. Story here. Video with LEO comments here. The suspect looks and sounds like a mentally ill person. i would do what he said and pull over. I would make contact with the suspect and place him on a 72 hour observation for his mental illness and if the doctor report shows that the suspect is not mentally ill I would cite him for interferring with the duties of a police officer. Ow. Okay, it's unwise. Is seat-belt specialness right? Prolly not, at least in normal situations. Conversely, police are explaining they are (in some circumstances; state and local laws may vary) exempt from seat-belt laws, as they may have to exit the vehicle rapidly in pursuit of a malefactor. Me, I figure the habitual non-wearing of seat belts is its own reward. Oh, The Moral Of The Story? Ain't one -- but Mr. Concerned Citizen is havin' his day in court and may be fined or spend some time in the hoosegow. In Detroit. The fed.gov promises absolutely, totally, cross-their-hearts realio trulio, the world will not end in 2012, on 21 December or any other date. The man responsible for the modern aerosol spray-valve had a last name that sounded a bit like a spray can running empty! He was a talented inventor, holding hundreds of patents. His spray valve made him wealthy and he applied his wealth to philanthropy. It would only confuse you to add that Robert Abplanalp was a close friend of Richard Nixon and Bebe Rebozo -- but it's a confusing world. "Student Power IU" is pushing for a general strike at Indiana University come April, protesting reductions in state funding, University program management and a grab-bag of buzzwordy issues including racism on campus (seriously; they're claiming the old-fashioned, official, institutional kind, too, though I suspect it's actually an ugly echo of the odious Woodrow Wilson* and they are arguing for the continuance of special treatment; but I digress). The organizing document is an interesting mishmash of anti-capital/anti-marketplace notions sitting uncomfortably with the belief that, since their tuition bears an increasing percentage of the cost, students should get more voice in how the university is run: do they believe you can have it both ways? It does make token nods to popular causes -- the environment, race, "the liberatory potential" of a college education -- but the overwhelming tone is one of entitlement. They plan to strike 'cos they aren't getting everything they want at a price that suits 'em. --Now usually, when customers strike, that's called a "boycott," and they go shop somewhere else (how long would IU last if the student body departed en masse for ivorier towers? Instead of, oh, paying their tuition and then acting up?). None of that for this lot! They'll strike! Just like bus drivers, garbage collectors or electrical linesmen, they will withdraw their valuable services from society and then we'll see! Just how long do you suppose it'll take before we're suffering from the lack of IU students? Other than the slight increase in signs waved and bong smoke, will anyone even notice? --Other than the striking students themselves, who may find the awarding of degrees somewhat delayed once they've stopped working on getting 'em. * I strive to always refer to that miserable racist as "the odious," and I recommend the practice to you. So, this morning, a slightly worse than usual edition of the Usual Headache is accompanied by a vicious backache. Hot pad is not helping; I'm just gonna go about my day and try to ignore it. ...Outta bacon. Had to cook up a little bit of Tam's pancetta instead! Dateline: Georgia Street, downtown Indianapolis-- It started as a "party street" for the Superbowl, a "pedestrian-friendly connector" between the Convention Center and what was then known as Conseco Fieldhouse (now Banker's Life). The city spent nearly $13 million on the re-do. It even had a zipline! Afterwards, the zipline moved on, the fancy boardwalks turned ugly and the city quickly learned it was homeless-friendly, too -- but not especially business-friendly. Ooops. So the bums were out (who're they, to want a place to sit down? Just because the city's got tables and chairs set out for the public!) and it has been floundering around ever since. This season's flat, dead fish is called "City Sidewalks." It's a kind of holiday market, complete with an ice-skating rink. --Except it hasn't got any ice. "Leave your skates at home," the thing is made of some high-tech plastic and they'll provide skates. Yum, shoe-sharing! (We had high-tech no-ice ice-skating way back when I was a teenager: it was called "roller skating." But you weren't required to wear pre-sweated shoes if you owned your own). The city is hoping -- oh, how they hope! -- that it will draw more than flies and bums. Good luck. One pub-owner along the street rates the post-Superbowl venue a "C+" and he's hardly a disinterested observer. Your -- or at least my -- tax dollars at work! It makes me so proud. David Bisard is back in the news. He drove his police car, possibly while intoxicated on duty, and struck a group of motorcyclists waiting to turn left, killing one man and injuring two other riders. That was in August 2010. Evidence has been repeatedly mishandled and the city has a new police chief and Public Safety Director over it. Over two years after the crash, his attorneys are concerned he might not get an impartial jury here in Indy. --Ya think? I'm of two minds; while we want juries (and judges!) to be fair, as the mechanics of law have worked out, "impartial" has come to mean "ignorant" and I am not at all sure that was the original intent. In a case like this one, in which news coverage has been extensive and widespread and the facts of the traffic accident itself are not in question, only the officer's blood-alcohol level, A) where are they going to go to find a pool of jurors untouched by the news and B) how much difference would it make? Nothing will bring back the dead, but ensuring Mr. Bisard is never allowed behind the wheel of a police car again would be a darned good start at protecting the living. Certainly IMPD has shown they cannot be counted on when one of their own has done wrong -- now we will find out if the court system can be. Update (same link) He got his change of venue. Sure hope the town they pick has a good hotel, since the media will all set up there for the duration! In a sadly senseless incident* in Vanderburgh County, a pair of deputies investigating vandalism encountered a man who threw a hatchet at them; they shot and killed him. "..why do they have to kill them??? They have rubber bullets, tear gas and pepper spray...Why are the killing all these people ?? Shoot their arms or knees and disable them...Lets stop the killing !!!!!" --Because we all know, when someone is throwing a small ax at you, there's all kinds of time to decide how to react; and a spinning, heavy, sharp object isn't a real threat, right? Not like a gun! About that: even if the deputies were wearing the kind of pistol-rated body armor police sometimes wear, it's vulnerable to edged weapons -- all the more if the weapon is applied with force; and the armor doesn't protect the wearers hear or limbs. In armor, they'd've been safer if he was shooting a .45 at them. Is this a tragic story? Yes. But (at least as reported) the blame for the hatchet-throwers death rests squarely with him. Real life isn't a TV drama; it's people very like you, in high-stress situations with no time to ponder. Don't want to be shot by Officers Of The Law? Then don't throw sharp weapons at them. *Also a senseless headline: SW Indiana sheriff: Deputies kill man with hatchet. Um, Mr. Headline writer? Sir? Pleeeeeeeeeze stop that! Also, this. This morning's Overheard? The best part is, I was trying -- and failing -- to enunciate "Zumbocolypse!" Which is when bezumboifying reaches epic proportions. But what Tam heard was funnier. Poor, poor Bob Costas, being criticized for having shot off his mouth pushing gun control over a horrible murder-suicide, in which an NFL player, a large, strong man quite capable of bare-handed deadly mayhem, shot and killed his girlfriend and then -- rather later -- shot himself. Mr. Costas, from the depth of his years studying psycholo-- Ooops, calling sports play-by-play, confidently assures us that had the killer not had a gun, none of this would have happened. But don't blame ol' Bob. Why, if he hadn't had a microphone, he'd'a never said such a thing. Remember, about the people you watch on TV? Pretty much the same crowd who tightrope-walked the monkey bars and/or stuffed pencils up their nose all through their school years, shouting "Lookit me!" the whole time. They've become grayer but no wiser. I Have Done Been Mooned! Brian J. Noggle offers a country Moon in contrast to my recent city Moon. His is a nice panorama, something I rarely have enough backing-away space to manage. --He points out he was working without a tripod, since moonsets wait for nobody. Otters have been reintroduced to Indiana waterways, hurray! Pretty successfully, too; DNR says only 20% of Indian's counties are otterless. A big win for the environment, right? ...Except ottering is a high-energy activity. Otters having perfectly good legs, they've discovered that the many, many stocked* fishing ponds in Indiana are a kind of otter buffet; or, as a commenter put it, "They are nothing but fresh water sharks eating everything in their path." * All native fish, are they? Local headline: "Gunman wearing dress robs convenience store." Left his sunglasses behind, too. Fingerprints, anyone? One too many Batman movies? The kind of "cunning plan" that comes from overuse of intoxicants? Somebody needs a "WWRuPD?" bracelet! ETA: I've figured it out: he was hoping to be a compromise pick for Secretary of State! Except maybe for gummy bears. Or if you live in Gary or Detroit; otherwise, the world really is becoming less violent. So argues Steven Pinker, in a recent book and in the Wall Street Journal, and he's got charts and graphs to back the notion. He shows an overall decline in murder rates in Europe of the last six centuries and a stunning decline in battle death rates over the last 60 years (Mind you, that last pair of dice have been breathed on: start with WW II underway and proceed while huge advances in battlefield medicine are being made and a steep decline is well-nigh inevitable). Still, the man may be onto something; and if he is, you're wondering, why does is seem the world is a more violent place now? When conflict kept decently (?) to the battlefield, it was safely out of sight and firmly out of mind. When conflict makes cars blow up in London or knocks skyscrapers down in Manhattan, it's much harder to ignore. When most murder consisted of a largely-ignored lower class preying on itself, who noticed? When crime trickles into "safe" neighborhoods, and stops being something that only happened to those anonymously ethnic people who live in those nasty buildings across the river, it gets a lot more attention. When "news" consisted of slowly spreading rumor, or, later, what the editor of your local paper could scare up or make up about the wider world, you were a lot less likely to hear about what was happening in Utter Outlandishstan, or even Nebraska. Today's appetite for news is insatiable -- mass murder in Mumbai? Rioting in Rio? Look for lurid video at the start of the show! Like -- and in part due to -- modern communication media, violence is everywhere. No one takes a picnic lunch out to watch the battles; that had become a very bad idea at least as early as 1862. Now the battle comes to you. Ready or not. The world is less violent -- but the violence is more evenly distributed. Ah, egalitarianism! Does it still seem "fair?"